The Duke of Edinburgh had two stag parties before his wedding to the Queen and the couple were showered with rose petals as they headed off on honeymoon. The information is among 60 facts released by Buckingham Palace to celebrate their diamond anniversary. Another fact reveals how their wedding cake on 20 November 1947 was 9ft (2.74m) high. Royal family members have attended a celebration dinner hosted by Prince Charles at Clarence House. The Queen is the first British monarch to celebrate a diamond wedding anniversary. The list of wedding facts also disclosed that on the day of the wedding, the grave of the Unknown Warrior was the only stone not covered by a special carpet inside Westminster Abbey. The day after the ceremony, the Queen followed a tradition started by her mother of having her wedding bouquet returned to the Abbey to be laid on the tombstone. And among the 2,500 wedding presents were two pairs of bed socks and a home-made tea cosy sent by members of the public. Buckingham Palace said Prince Philip had his two stag parties the night before the wedding - the first, held at the Dorchester, saw the press being invited. The second saw the groom head to the Belfry Club with a group of his closest friends. Preparations for the historic event included the checking of BBC microphones due to a previous incident at a royal wedding in 1934, where the Abbey cross hit a microphone which was dangling above the altar steps. They departed for their honeymoon in Broadlands in Hampshire, home of Prince Philip's uncle Earl Mountbatten, from Waterloo station, accompanied by Her Majesty's corgi, Susan. The royal couple have already revisited Broadlands as part of their anniversary celebrations. On Monday, the day before their actual anniversary date, they will be attending a service at Westminster Abbey, where they were married. 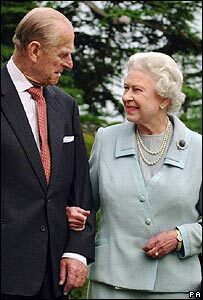 On the day of their 60th wedding anniversary, the royal couple will travel to Malta where they lived as a young married couple from 1949 to 1951 while Prince Philip was stationed there as a serving Royal Naval officer.